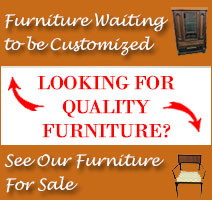 At Furniture Medic by MasterCare Experts, we take great pride in bringing new life to your furniture through expert furniture restoration and refinishing services. We are especially proud when our work can save a cherished family heirloom so that it can continue to bring joy to new generations of the family. It does not matter whether your family heirloom has monetary or sentimental value. 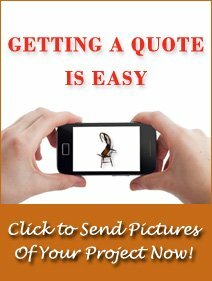 If it has value to your family, we are happy help ensure its longevity with expert furniture restoration. Meet Lenny. Lenny is a wooden rocking elephant that was created from scratch by the father of a customer. Our customer remembers riding Lenny when she was young. Her own, now grown children, rode Lenny when they were young and now her grandchildren are old enough to ride Lenny. 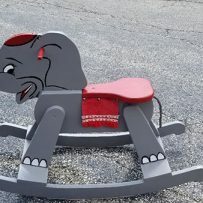 However, after bringing happiness to two generations of our customer’s family, Lenny was not quite in the condition to be ridden by her grandchildren. 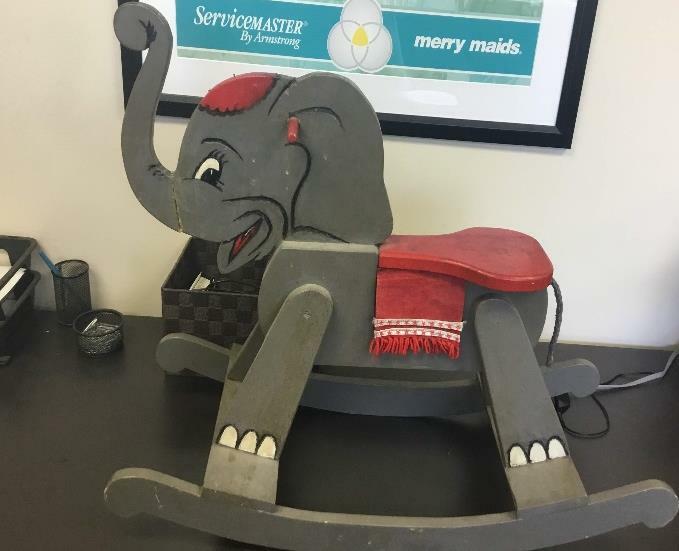 When Lenny arrived at Furniture Medic by MasterCare Experts, he had a badly broken trunk and was in desperate need of some overall refreshment. Lenny’s refreshment included a good scrubbing, sanding, a new coat of skin, a manicure, new eye highlights, and some general teeth whitening. When the work had been completed on Lenny, his mom (our customer) came to pick him up and informed us that he would soon be flying to Florida where he would be meeting his new mom. We anticipate that it will be several more years before Lenny needs another face lift. Our customer knew that Lenny was in good hands when she brought him to our expert craftsmen at Furniture Medic by MasterCare Experts. We specialize in restoring and refinishing wooden furniture and knew that we would be able to restore Lenny to top shape for her grandchildren. In order to get Lenny back in shape, we had to first clean up the water damage and dirt buildup from the surface. The surface was then sanded down so we could apply a new finish and freshen up the paint. We also repaired Lenny’s broken trunk. As you can see in the after picture, Lenny was completely rejuvenated and looked ready to go to his new home. Precision Repair: We can repair surface damage on wood furniture including scratches, gouges, dents, watermarks, stains, burns, and other surface blemishes. Re-Gluing/ Minor Adjustments: We can repair damage to wood furniture with effective gluing and readjustments. In this case, we repaired Lenny’s broken trunk. Finishing: We use a deluxing process to remove scratches and other damage to the finish. Restoration/ Finishing: We apply a new water-based factory finish to protect wooden furniture. Furniture Painting/ Color Matching: We can repaint wooden furniture and we offer color matching to ensure that we repaint or refinish the piece to restore its original look. In Lenny’s case, we were able to refresh the paint to make him appear animated again. 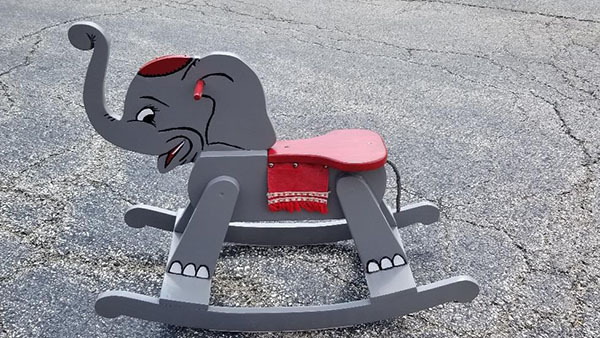 If we can revitalize Lenny so that he can continue to entertain new generations of our customer’s family, then we can also bring new life to your cherished heirloom so it can be enjoyed by future generations of your family. Our expert craftsmen can repair and restore a wide range of wooden furniture and we take special pride in refinishing pieces that are important to our customers. Our team at Furniture Medic by MasterCare Experts would like to wish Lenny the best. We are happy to have been able to be part of his continuing legacy of bringing joy and memories to future generations. If you have a treasured family heirloom that could benefit from our furniture refinishing and restoration services, contact Furniture Medic by MasterCare Experts by calling (630) 653-3131 or submit your project online.